Well, whadda ya know…I’m now a Purex Insider 😉 I think it’s cool that I’ll be getting samples of new products to test before the general public, don’t you? I just LOVE being special! 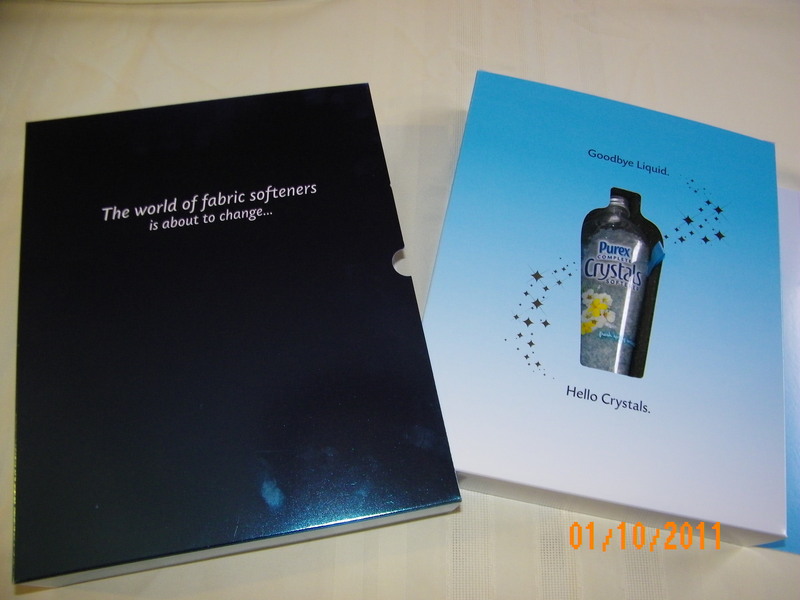 But now more about Purex Crystals Softener. o back, I wanted to try a load each way. On wash day, the first load went in, and so did the Purex Crystals. The bottle had it’s own little measuring line right on the bottle. No measuring into a cap here, that’s a really cool feature. The scent was very nice, it’s called Fresh Spring Waters. It even made the whole laundry room smell nice as the load was washing. Very cool! So when it was done, I put the load in the dryer without a dryer sheet. After drying, I took the load out and proceeded to fold. The clothes smelled nice and seemed pretty soft. And then there it was…the snap, crackle, pop of STATIC! OK, so I guess did it wrong and you need to use a dryer sheet. I proceeded to do the next load, this time I made sure I used a dryer sheet. When the load came out of the dryer, I folded everything and there wasn’t any static. Thank goodness! But I noticed that you also couldn’t distinguish the scent of the Purex Crystals from the dryer sheet. That’s the only thing that I didn’t like, however. The clothes from both loads felt silky soft, none of my laundry had ever felt that way before. Then I read more from the materials in the box…no oils, does not impair flame-retardent qualities of children’s sleepwear, does not reduce the effectiveness of sportswear, I could definitelyget used to this. So then I tried the ultimate test, I used one of the towels when I took a shower. Oh my goodness, that towel soaked up more water than it ever had! And it definitely didn’t feel scratchy, that’s something I’ve always hated about my towels. And I’d like to mention that even though I used the towels a few days after washing, I could smell the light scent of the Purex Crystals, but NOT from the dryer sheet…an added plus! So I give this product about a 4 1/2 out of 5 stars, since I still have to use a dryer sheet with it. Three winners will receive a coupon good on a bottle of Purex Complete Crystals Sogftener and one will receive a coupon for a free bottle. Leave a comment letting me know why you’d like to try the Purex Crystals. Email subscribe to this blog & verify. Email subscribe to our newsletter. Link to this blog. Add us to your blogroll or grab our button. Add this giveaway to any Linky or contest/sweepstakes listing site. Make sure your comment includes which items you performed for extra entries. Context will end on friday January 21th, 2011 at 11:59 PM CST.Winner will be chosen by online random generator. Winner will be notified by email, so make sure your correct email address is in your comment. Disclosure: I received a 5 load sample from Purex to test and complete this review. No additional compensation was received, and the opinions expressed…good or bad…are my own. Sorry Cindy, only one per person 🙂 Thanks for stopping by! Hope to be able to send the free coupon your way! I’m in! I want to try it for free, hate to buy something and then there’s the possibility that I won’t like it. Tried to get these coupons on a bunch of other sites, but didn’t win. I followed and tweeted. 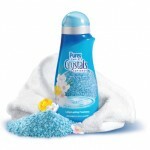 Would love to try Purex Crystals. Laundry tip for you – don’t tell my husband because he’ll just laugh that I am giving out laundry tips – you’re actually not supposed to use any type of fabric softener on towels. It apparently decreases the absorbency of things over time. I wonder if they somehow addressed that when they came up with these crystals? Good to know you like them though. I’ve seen these in the stores and wondered about them. Hi, I would love to try the Crystals out. I am on a fixed income and the plus for me is not having to hobble down to the basement to catch the softener cycle. Throw in the running. Thanks! Sorry, I forgot it’s 2012 now. LOL.